With an undulating parapet trimmed in bright orange paint, the recently renovated depot is a Route 66 landmark and home to a popular railroad museum. 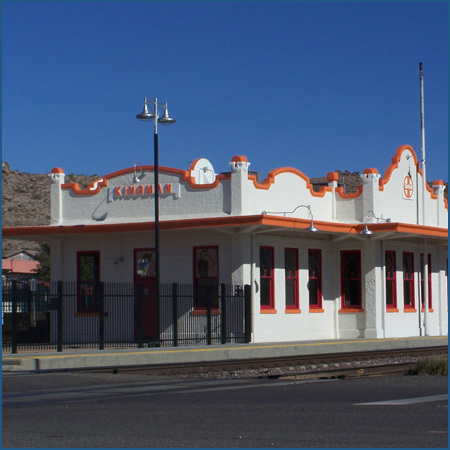 The one-story Spanish Mission style station in downtown Kingman was built in 1907 by the Atchison, Topeka and Santa Fe Railway—commonly referred to as the “Santa Fe.” The construction utilized poured concrete in an effort to ensure a fireproofed building. This was a calculated decision on the part of the railroad, as two previous stations had burned down on that same location upon contact with hot cinders from passing steam engines. The long rectangular structure features a fanciful roofline ringed by an undulating parapet with remates—the curvilinear gables common to Spanish Mission design. Ever proud of its transcontinental line across the Southwest, the Santa Fe installed its cross-within-a-circle emblem on the faces of the gables. A combination depot, the building accommodated both passenger and freight services. From the outside, the interior arrangement of space is easily identified through the placement of windows. On the east end of the depot, small windows are set high in the wall to allow light into the freight room while also discouraging theft. Large double doors could be opened to allow carts laden with crates and parcels to be rolled between the building and the train. On the west end, large windows permitted natural light to flood the waiting room; the upper sashes display a diamond motif reminiscent of Arts and Crafts design. From a projecting trackside bay, the station master had an unobstructed view down the tracks so that he could monitor traffic on the line. A canopy wrapping around the building shielded passengers from the harsh midday sun and the occasional rain shower. By the early 2000s, after almost a century of service, the depot had fallen into disrepair and was closed to the public. Train travelers subsequently used a small waiting room located in a storefront on the north side of Andy Devine Avenue across from the depot. The city began a search for grants to support a full rehabilitation. In 2002, Kingman won $471,500 in federal Transportation Enhancements funding that was administered through the Arizona Department of Transportation. The city provided a $28,500 local match. Design changes increased the final project budget to approximately $850,000, and additional funding was provided through the city, Amtrak, the local historic preservation society, and the federal Community Development Block Grant (CDBG) program. Approximately $150,000 in CDBG funds went towards making the depot accessible to all users, which encompassed work on the restrooms, automatic doors, parking area and sidewalks. Prescott-based Otwell Associates Architects, a firm specializing in historic preservation, was selected to carry out the rehabilitation project. Work included repairs to the exterior stucco, restoration of the original doors and windows, installation of new heating, plumbing and electrical systems, construction of a ramp for wheelchair users, painting, and landscaping. Ultimately, city officials and the architects strove to return the historic building—a contributing structure to the National Register-listed Kingman Commercial Historic District—to its 1907 appearance. Efforts were put on hold for many years as the project expanded in scope and additional state and federal entities became involved. One of the most important tasks was for the city to secure a long-term sublease from Amtrak, which leased the interior from BNSF Railway—owner of the building and land. To take advantage of project momentum, Amtrak offered to construct a new 700-foot long concrete platform, which required multiple approvals due to stringent safety regulations. The platform is ADA compliant and includes tactile edging. New light standards along its edge create a welcoming glow as the west and east bound trains stop in the evening, and a fence incorporates the classic Santa Fe logo. Employees of the Kingman Parks Department, along with volunteers, landscaped the area around the building. Following years of planning and patience, the depot officially reopened in spring 2011. The swooping gables, canopy edge, and window and door frames are now painted a vibrant orange that calls attention to the depot and affirms its role as the centerpiece of the downtown revival. Inside, concrete floors were refinished, while outside, some of the original brick pavers were laid around the depot as part of the landscaping plan. One half of the depot is used for the Amtrak waiting room and office space, and the other portion houses a museum focused on local history and railroading. Prior to its official founding, the territory surrounding Kingman was inhabited by a mixture of American Indian tribes. The first American expeditions to the area began in the early 1800s. Kingman was founded in 1882 and named for Lewis Kingman, who helped develop the Atlantic and Pacific Railroad route from Albuquerque, New Mexico to Needles, California, which passed through what would eventually become Kingman. The town became a major shipping and trading center for precious metals and cattle after the railroad arrived in 1883.